Security executives, pushing the limits of traditional labor-intensive IT patch processes that cannot close vulnerabilities fast enough, are turning to virtual patching to protect servers and desktops against new cyber threats. Virtual patching offers a proven strategy - delivering timely protection within hours of vulnerability publication - weeks or months ahead of the traditional patch. 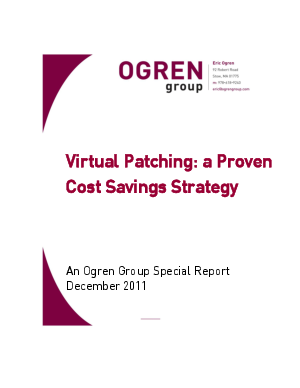 In addition, security executives leveraging a virtual patching strategy are achieving compelling cost savings by reducing the frequency of patch and software maintenance cycles.